Listen to true tales, told by the sinners themselves, about times they’ve left the world worse than they found it. Join us for a night of crazy confessions, juicy secrets, and malicious misunderstandings that have left even the finest of folk holding the bag. 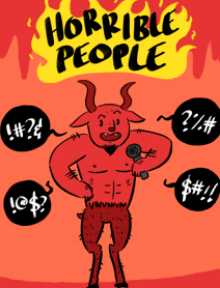 Horrible Peoplesets out to prove that there’s humor to be mined from the least humorous of intentions, and the best stories often arise from the worst decisions.